Invite your friends to join Catalyst 100 on WhatsApp. 1. The New PrepLadder App: Download the new PrepLadder app for the best experience of CATALYST 100. Note: If you already have the app, you will have to download the latest update to access CATALYST 100. **You will be able to take tests, review solutions, ask doubt and do much more on the new PrepLadder app. 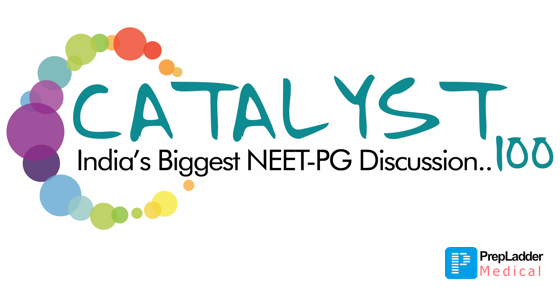 Catalyst 100 will be India's Biggest NEET PG discussion. Team PrepLadder has carefully selected 500 most important topics from NEET PG point of view. One question will be selected per topic and 5 such questions will be discussed per day (includes images). Answer with detailed explanation will be shared the same day, the explanations will be high yielding and will cover the entire topic. Therefore, in 100 days you will be able to cover a total of 500 important & most expected topics for NEET-PG. Topics for the entire week will be shared in advance so students can be prepared and actively participate in the discussion. 1. Questions selected by toppers and high yield explanations built by subject experts. 2. Get five questions from High yielding topics daily. 3. Prepare five topics daily in a systematic way. 5. Get detailed explanations the very same day. 7. Assistance in Fast track preparation. 8. Guaranteed improvement in just 100 days. More the students, better the discussion. Invite your friends to join CATALYST 100. Many questions from the topics discussed in Catalyst 100 WILL appear in NEET PG. Do not miss this priceless opportunity.